1.- Phil Edwards: The creator of the casual style. He made the drop knee turn popular. Stylish parallel stance rider. Every move he made looked so easy, even in the most critic part of the wave. It didn’t matter if it was small or big, he got the same confidence. From the knee paddle take off to the kick out, it was an exercise of fluid movement. Never obssesed with noseriding, he surfed for the most part in the middle and back part of the board. 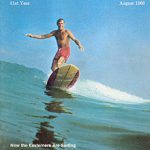 His favorite board from the late 50s and early 60s was a ten feet heavy board perfect for his style. He used the inertia that the board gave him in his advantage turning with just a subtle feet move. 2.- Bernard “Midget” Farrelly: Disciple of master Edwards. When Midget was just a kid, saw the first Bud Browne films in which Phil Edwards appeared. Midget tried to surf the same way, developing his own style. Farrelly was a pretty advanced surfer compared to the aussie average. One of the few who could hotdog in such waves as Pipeline. 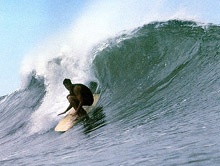 While others made a survivance take off and shot the curl, he showed he could noseride and make some whip turns. His style suddenly looked old fashioned when Nat Young came. 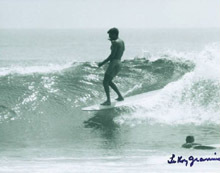 3.- “Little John” Richards: Minimalist style surfer from the flow school and poetic functional moves. Very good with the lost technique of stalling the board. Even surfing backside looked good. Another surfer who didn’t care about hotdogging. Less is more. 4.- Miki “da cat” Dora: Hotdogger style 100%. Perpetual motion. Almost telegraphic corporal language on a wave. The most subtle noserider. Good wave reader. 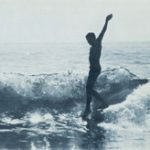 A sense of originality light years away from his fellow competitors: backwards surfing, contorsionist trimming, parallel stance, switch blade bottom turns… Special talent for avoiding the crowds in the breaks of Malibu. Influenced by Matt Kivlin. 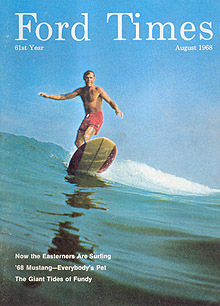 5.- Jock Sutherland: He ruled the hawaiian waves in the mid part of the 60s. A thin guy who could move the heavy weight boards of the era. Switch stance master. He could rip Pipeline with the unfunctional equipment of 1965. Surfing without an apparent effort. 6.- Joey “the gazzelle” Cabell: Hawaiian style of confident turns. Very advanced style for the era. 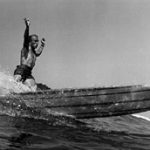 His hawaiian surf style was adapted to the California surf. Good noserider. He could adapt well in the shortboard era. 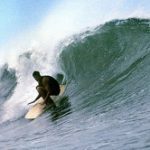 His Rincon surf sessions are classic. No problem with the big stuff. 7.- Dewey “little man on wheels” Weber: Pioneer of the hotdogging style. This guy seemed to be always in motion. His small height and musculated body were and advantage for manouvering the boards of the era. Great cutbacks in big stuff like Makaha or Sunset. Real fast walking the board (as his nickname denotes). 8.- David Nuuhiwa: Cat like agility while walking the board. The impossible noseride man. He switchstanced in the very nose. He took advantage of the better shapes of 1966/7. Another one who got no problem adapting to the shortboard. 9.- Kemp Aaberg: He’s famous for his arch stance, since John Severson took a picture of him in that pose. Fluid, subtle and good wave reader. 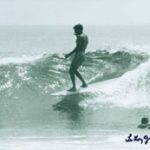 He surfed Rincon with a wonderful style. 10.- Nat “the animal” Young: He drank in the fountains of Phil Edwards and Midget Farrelly. 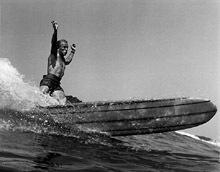 One of the firsts power surfers. His perfomance in the 1966 world contest blew lots of minds and marked the end of an era. Surfed from the back of the board with no obsession with noseriding. Focused in surf the critic part of the wave. 11.- John Peck: He took the “Mr. Pipeline” title from Van Artsdalen. 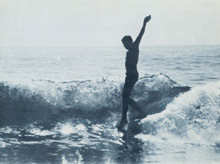 His trademark was a backside bottom turn with his feet almost side by side. Total confidence in hairy conditions. Another light weight kind of guy who could move those boards with apparent easy way. 12.- Butch Van Artsdalen: Strong personality and big balls. Maybe the best switchstance rider. 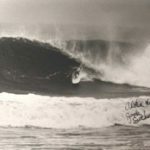 He could change feet in big Waimea or in a hollow Pipeline. His big muscles helped his strong cutbacks. He developed his style in the powerful Wind’n’Sea waves. He was the original Mr. 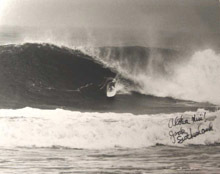 Pipeline before John Peck, Jock Sutherland and Gerry Lopez came.